THE MAY 2 SHOW IS CONFIRMED AS OF JAN 15, 2019. TICKETS ON SALE AS OF FRIDAY JAN 18. Edited 4 time(s). Last edit at 2019-01-15 21:30 by bv. at the big Hilton down along the waterfront (quick walk from the Quarter - near Harrahs Casino). They also have one out in Metarie, not too far from the airport. The best fried chicken on the planet (another superlative I don't use lightly) - Willie Maes Scotch House. 10 minute cab ride from the Quarter. Only lunch - closes I think at 5pm now. Can also get busy - but this one is worth the wait. My favorite restaurant in the city? I'd have to go with a place called Jacque-Imo's. It's out at the end of the GarDEn district (a good 15-20 minute drive from the Qtr.) but this place is THE place for great New Orleans food in a fun, casual atmosphere. I always try to get there right when it opens at 5:30 - or else you'll be waiting. They don't take reservations. Right near there to burn off some calories after is Rock n Bowl. Super fun place for tunes and...Bowling! Also, right next door is the Maple St. Bar - which I guess gets hopping with great tunes for Blues fans. Some other places: For Po Boys - I do have a soft spot for Mother's on Poydras (quick walk from the Qtr). Again - there can be a line. There are better Po Boys in town though - Parkway Bakery is really good. Fancy places worth the $$ - Emeril's (his original on Julia St.) is actually worth the hype. You probably won't see him there, but the food and service are great. He also has a place in the Qtr. called NOLA which is a bit more casual and good. My favorite dress up fancy place is Arnaud's. Total old school New Orleans - in the Quarter. Steer clear of the Remoulade place attached though. They have a cool little Mardis Gras Museum upstairs you can visit even if you don't eat there. If you do though - the soufflé potatoes are a must. Which brings me to - I tend to think the more casual places often have the better food! (For instance, I'd put the food at Jacque-Imo's up again any place with white table clothes that will charge you twice the amount). Of course fancy, romantic or special occasion does have its place. For that, I'd stick with Emeril's or Arnaud's. Or Bayona too is lovely. A causal place in the Quarter with great New Orleans food that won't cost an arm and a leg? Coop's Place. Anotherone that for those very reasons can get busy. It's a bit divey, but for the money (like $13), the Chicken Tchoupitoulas is maybe the best dish in the Qtr. It’s not far from iconic Café du MonDE and its DElicious beignets. Not too far from there (and in the heart of where you can hear a lot of great music - the Frenchman St. area) is The Praline Connection. Cool place - very New Orleans, good soul food. Or, in the mood for just a good burger? Yo Mama's, (may have changed names) across the street from famous Preservation Hall and Pat O'Briens, a tourist favorite, famous for their Hurricanes and dueling pianos. When you get tired of eating and drinking, or for a rainy day, a great museum to visit is the World War II Museum. Top notch! You can spend a whole day here. There’s a Tom Hanks produced multi-media movie that’s a must. 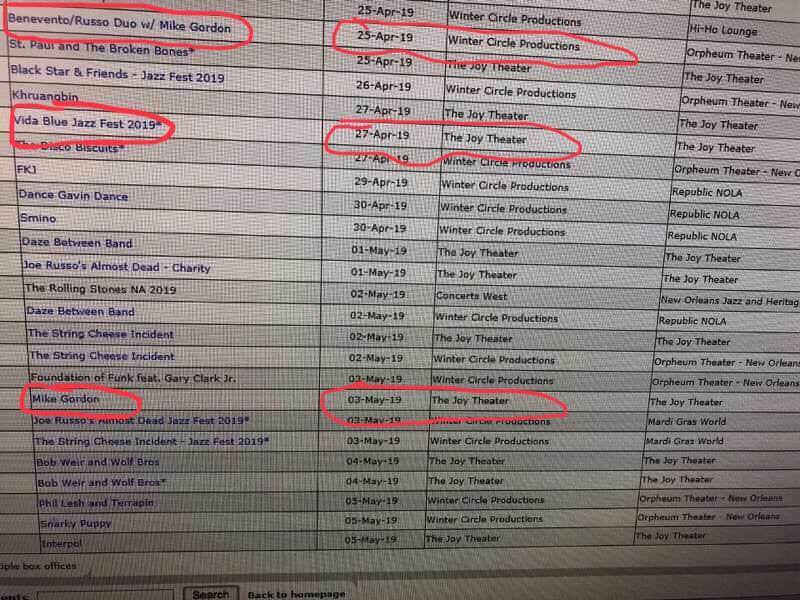 This was posted on a Phish-realted site (hence the highlights of solo band members shows), but it seems legit and you can clearly see The Stones are indeed slated for May 2nd at the Jazzfest site itself (on the far right, a bit cut) and not the Supperdome. This may be an older list, though, since several of the bands shown here have already confirmed their shows, but on different dates. Being from Tennessee, this might be the one show I try for this time if it is in the Superdome. I don't want to drive a day each way for hot and humid or wet and muddy in an overcrowded standing area. I might be able to get a comp room at a Biloxi casino and drive in and out from there to help expenses. I went to Atlanta 2015 so will hope for another show there eventually if this one does not work out. Edited 2 time(s). Last edit at 2018-11-21 20:39 by tonyc. Jacques-Imo's is nowhere near the Garden District - it's in Riverbend, way up river from the GD. It's almost to the parish line. In the FQ, Johnny's Poboys is stellar, too. And... there's a Camellia Grill in the FQ, just around and down the corner from Johnny's. They'll never play the Superdome again. The last time was 1994. Thanks for the info DEmmerson! Does anyone have any insight as to what kind of setup this could be? e.g. What has NOLA Fest done in the past for the big names within the fairgrounds will there be any kind of pit? VIP? etc? It would appear it will be a separate purchase from the regular festival day passes and VIP weekend passes. Or is it just a chill and grab a spot best you can kind of thang? Some people are speculating they will do the show at the Superdome but the insiders are saying no fricking way. The main stage is called Acura which is on the very left of the map.Right in front there has always been a VIP area which they call Grand Marshall. Off to the left and right are 2 more seated VIP areas called Krewe and Big Chief. The only other place that has seating are bleachers way in the back which are part of GA, almost all of GA is standing on the field.If you do GA you either get there first thing and camp out or resign yourself to just enjoying the crowd, sight lines are not that good. I am guessing the Stones will add a catwalk in front of the existing stage and add their backdrop stuff. Not sure if they will use the existing sound or not, but I think they can clear out the catwalk, backdrop and sound and reinstall the standard Jazz Fest stuff overnight as long as they reuse the main stage. If they do this there will be Pit(s) in front. Rumor is this day will be a separate ticket around $150 GA and attendance will be capped. If you want VIP you will need to get as soon as tickets come on sale, trust me on this, unlike normal stadium shows. Assume there will still be other shows around the fairgrounds as well as several acts before the Stones at the Acura stage. I find the food very good and usually make an afternoon of it. Recommend a light waterproof parka, a hat, some sunscreen, cool looking sunglasses (it is the Stones after all) and a small back pack to keep things in.Do not bring an umbrella, it's too crowded and the locals will give you grief. Rumors are Dave Matthews Band, Santana and WideSpread Panic are headliners for the other 3 days that weekend. Edited 2 time(s). Last edit at 2018-11-22 18:33 by coloradocanyons. No. It's all the same except for the ticket price that day, which instead of the normal price will supposedly be either $175 or $200 for the whole day, with the one exception being that no other acts will be playing while the Stones play, from 5-7, which I believe is a first. The Acura stage is the biggest acts so, that's probably where they will be, if nothing special is done regarding the staging, which I have not found anything alluding to, they'll just have what everyone else gets. No pit, no anything special, just show up, get your spot, enjoy. Anyways, for large crowds, Mick likes the catwalk, and being a higher ticket price that day, we will probably get a more elaborate setup than usual jazzfest acts. There may be a pit separation for crowd control, (and to charge higher vip prices) but, again , pure speculation. Thanks for posting that list of shows happening in New Orleans during Jazzfest, mosthigh. Based on my experience at JF two years ago, I would expect to see most of the bands on that list on the Jazzfest line-up. I am definitely now in for the 2nd weekend. In April 1993 I saw Paul McCartney in New Orleans. It was during Jazz Fest but they booked him at the Superdome. It's possible the Stones could be booked there as well. They occasionally book off site shows of major acts. Haven't had time to read all the details above, but--there are two levels of VIP at Jazz Fest, which you have to buy for the whole weekend, and both VIP sections extend right across the front of the stage with general admission behind. In the past this set-up has been true for the really big name bands as well for the less huge headliners. I personally don't do Jazz Fest anymore for bands I really want to see because I can't afford the VIP, which is the only way to get up front. but I believe the "regular" VIP passes are still for the whole weekend this year, but they have already announced this *extra day is excluded from those. I'm betting the rumored $150-$200 day price for the *extra day pass is general admission and they will offer VIP opportunities for that day additionally. *extra day = the Thur that used to be "locals" day, which will now be on the preceding Thursday. There's 3 at the main stage, Acura. Grand Marshall (pit in front), Krewe (covered and seated off to the left on the map) and Big Chief (covered and seated off to the right on the map). In spite of what some others have said, these should still be in place for the Stones show. And yes, the Thursday show GA price is not the VIP areas, and it's believed that the Thursday show will be a separate ticket from the weekend. Edited 1 time(s). Last edit at 2018-11-24 18:03 by coloradocanyons. It's not possible! The Stones are not playing the Superdome. They are playing at the Fairgrounds. Brass passes are not viable the second Thursday. I suppose it really depends on demand. If there is a very high demand, they may move the venue for logistic concerns. Really, as you well know, both venues are only short drive apart. Weather is always a factor at that time of the year. They had about 24,000 some show up out of 60 some thousand tickets available in 1994 and haven't been back since, with supposedly a visit planned for the Arena sometime around Katrina but that fell through, obviously, like everything else did. I would think it's highly unlikely they would want to play the Superdome again and the fact that they are coming for Jazz Fest is probably a miracle in itself. That would drive the ticket price up even more, and who want that? This one's definitely still in the cards..
Not sure when the announcement will be made, soon I would imagine. Reading over at the JF forum that it's rumored the tickets for the day will be "limited" to 50,000.
that number may be small in comparison. 50,000 is a bit more than what Fest draws on locals Thursday. That would be reasonably comfortable at Acura Stage (the biggest stage). When there's a big Saturday or Sunday crowd (90-100k), it's just too packed. Elton John/Ed Sheeran day a few years ago was wall-to-wall people at the main stages. Lineup announcement has been delayed until January. The Superdome may be in play yet. I don't think the Jazz Fest fairgrounds can handle a Stones show. Well, they handled Springsteen, Elton, et al. I love Jazz Fest, but if you want to actually see a (big) band it's not the best place to do it. It's really great for smaller bands and for the overall vibe. I live in Louisiana, but am not planning to go if the Stones do play. Would you go if the Stones show was at The Superdome?